She broke out of her enclosure and decided to take a "short and peaceful excursion." An African elephant named Kenia had a very brief taste of freedom this week, when she broke through the electric fence of her circus enclosure just to explore her surroundings. 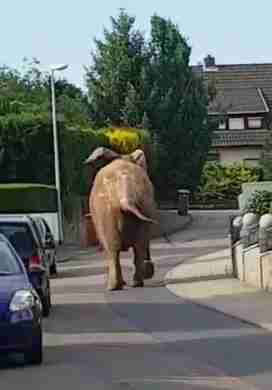 The circus she was with happened to be in the small German town of Neuwied. Surreal probably doesn't begin to describe the experience of local people strolling along the sidewalk, who had to stop to let Kenia walk past. But Kenia's little trip was called a "short and peaceful excursion." She seemed to enjoy merely being able to determine where she went and when. African elephants are emotionally complex and very intelligent animals who in the wild travel in large tightly-bonded herds. They travel an average of 15 miles per day — Kenia was only able to go a little over a half a mile on her solitary walk before she was recaptured and led back to the circus. Because of the stresses and abuses circus elephants undergo during training and performances, when an elephant breaks free, there can be deadly consequences. 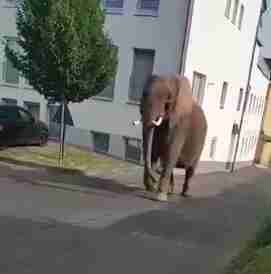 Just a few years ago in Germany, another circus elephant fatally trampled a 65-year-old man out for a walk. Because of the abuses suffered by animals and the risks to the safety of people when an animal breaks free, many countries in Europe and around the world have banned using wild animals in circuses. But Germany still lags behind. That a beautiful elephant like Kenia is still being made to perform is particularly sad, considering that African elephants also face many man-made threats aside from being used for entertainment, from habitat loss to poaching. 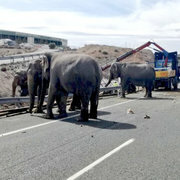 In fact, we are losing elephants at such a fast rate, they could go extinct in our lifetime. To help elephants like Kenia, you can sign a petition urging the European Union to ban wild animals in circuses. You can also donate to the David Sheldrick Wildlife Trust, an organization that raises orphaned baby elephants and teaches them how to be wild again.